Norovirus is a form of stomach bug that can cause severe vomiting, diarrhoea and dehydration. As with other forms of viral infections, Norovirus can make diabetes control more difficult. 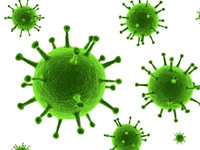 Norovirus has been called the winter vomiting bug because it is more prevalent in the winter months. How long does the Norovirus infection last? Symptoms of the infection will usually pass after a couple of days but it is possible the symptoms may persist longer in some people. What are the causes of Norovirus? Norovirus is a stomach bug which can be passed through contact with someone who has the infection or via contaminated food, objects or surfaces. Regularly washing hands, cleaning surfaces and practising good food hygiene can help to prevent the virus from spreading. There is no specific treatment to rid the body of Norovirus but your body’s immune system should be able to fight off the virus. It is important though to treat and prevent dehydration by drinking fluid regularly. What to eat with a tummy bug? The NHS advises we drink more than the 6 to 8 glasses of fluid that is usually recommended for fluid intake per day. This is because vomiting and diarrhoea depletes the fluid available within our body. Viral infections usually make diabetes more difficult to control. If you catch the Norovirus it is likely that your blood glucose levels will rise higher than usual as the body attempts to fight off the virus. Vomiting and diarrhoea both involve a loss of fluids from the body which can make dehydration more likely to occur. In addition, infections can raise blood glucose levels which can result in passing more urine than usual which could also raise the chance of dehydration. It is therefore important to take fluids regularly and look out for the symptoms of dehydration such as having a dry mouth, darker than normal urine or headaches. It is important, for people on insulin in particular, to regularly check your blood glucose levels to prevent your sugar levels going too high or low. If you have type 1 diabetes, Diabetes UK recommends performing a test for ketones if you have blood glucose levels above 15 mmol/l. If you have higher levels of ketones, this could develop into a dangerous condition called ketoacidosis, so contact your health team for advice.